The World Could Wipe Out Extreme Poverty By 2030. There's Just One Catch : Goats and Soda It'll take trillions of dollars — not billions, but trillions. Leaders are meeting in Ethiopia this week to figure out how to raise the money. Spoiler alert: Most of it won't come from governments. 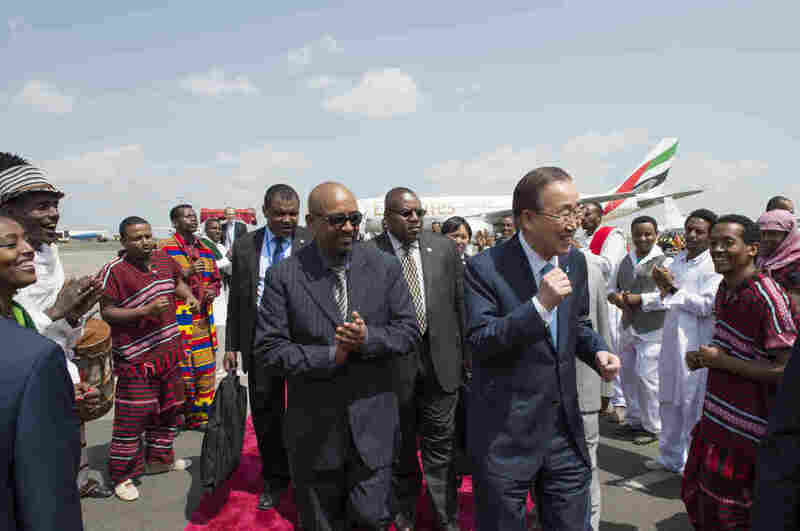 Secretary-General Ban Ki-moon (right, with blue necktie) arrives in Addis Ababa, Ethiopia, for the International Conference on Financing for Development. This fall world leaders plan to convene at the United Nations to commit to some sweeping goals: By 2030 they want to eradicate extreme poverty for all people everywhere. Also on the agenda: End hunger, stop all preventable deaths of newborns and children, and halt epidemics of diseases such as AIDS and malaria. Achieving such an ambitious agenda is going to require mobilizing some equally impressive funding. This week leaders are kicking off that effort — at the four-day International Conference on Financing for Development conference in Ethiopia's capital of Addis Ababa. The agenda builds on an only slightly more modest agreement from 2000. Back then nations vowed that by the end of this year — 2015 — they would cut in half the number of people who have to get by on less than $1.25 a day, along with drastically reducing deaths from disease and poor health care. Many of those targets have been met — including the extreme poverty goal. And it was substantially due to an unprecedented ramp-up in aid from rich countries to poor ones. But already there are worries the richer countries aren't going to step up for the next 15 years. "The soaring rhetoric of these new goals — end extreme poverty, ending hunger — doesn't seem to be matched by the political will and the financing," says Tom Hart, the U.S. executive director of ONE, which campaigns for international aid. Hart notes that in the past decade international assistance rose almost 70 percent to about $135 billion annually. But with the exception of Britain and a few smaller countries, no nation has lived up to earlier promises to devote 0.7 percent of its gross national income to aid. Even worse, says Hart, donor countries are spending less than a third of their existing aid on the poorest, most desperate countries. He says the share be should be at least half. "So we're asking donors, out of that precious foreign aid pot, to dedicate it to the poorest," Hart says. "Make sure that it is reaching those who need it the most." Hart is particularly disappointed that the U.S. government, the world's largest donor, isn't taking the lead on this. But Alex Thier with the U.S. Agency for International Development says if you count "fragile states" — like Nigeria or Pakistan — that aren't the poorest but that face serious challenges — the U.S. does spend about half of its aid on the neediest. "Those countries tax the world," Thier says. "Countries that are in conflict create refugees, become vectors for disease, and sometimes even [require] military engagement." And Thier adds that it doesn't make sense to devote a set percentage of aid to countries in this category because conditions can change so much. "We're not looking to tie our hands," he says. "We're looking to engage in good development practice." But for all the wrangling over aid dollars, Amina Mohammed, a top United Nations official, says this conference also marks an important milestone: All sides in the discussion recognize that government aid dollars are not going to be enough. "The billions that we've had from official development assistance is insufficient," says Mohammed. "We need trillions for this menu. And so what this agenda needs to do is to move from billions to trillions." Raising those trillions means unlocking other forms of funding for poor countries. So a lot of the discussion at this conference is about how to make it easier for private companies to invest in projects like building roads and power plants in poor countries. Among the ideas: offering them loan guarantees and helping them unravel complicated regulations. Another topic is how to smooth the way for immigrants from poor countries to send more of their earnings back home. Also, says Mohammed, there's a whole set of initiatives to help governments of poor countries raise more revenues through more efficient tax collection. "It's not about putting money on the table per se," she says. "But it's about giving you the tools." "There's nothing revolutionary about this," she adds. "It can be done."